American manned spaceplane. 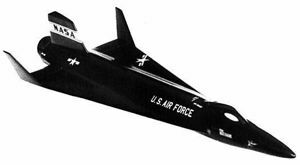 The crash-damaged X-15 number 2 was rebuilt to attain even higher speeds. 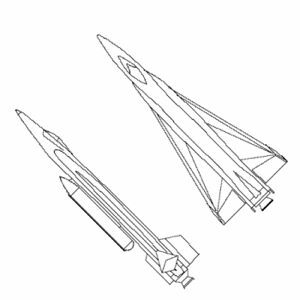 The body frame was stretched, and two drop tanks were added, increasing propellant load by 75%. Reached Mach 6.7 and 108 km altitude. Thrust: 262.45 kN (59,000 lbf). Gross mass: 25,455 kg (56,118 lb). Unfuelled mass: 8,317 kg (18,335 lb). Specific impulse: 276 s. Height: 15.47 m (50.75 ft). Diameter: 1.42 m (4.65 ft). Span: 6.80 m (22.30 ft). Apogee: 75 km (46 mi). An ablative heat shield was applied to protect the spaceplane during re-entry. The X-15A-2 reached the highest speeds and altitudes of any manned spaceplane until the space shuttle entered service. 700 hours was needed to refurbish the heat shield. The ablative covering had to be completely stripped off, then reapplied. After the record Mach 6.93 flight, the aircraft received thermal structural damage and the covering was severely pitted and charred. Repair was uneconomical and the aircraft was grounded. Crew Size: 1. Spacecraft delta v: 2,020 m/s (6,620 ft/sec). Stage 1. 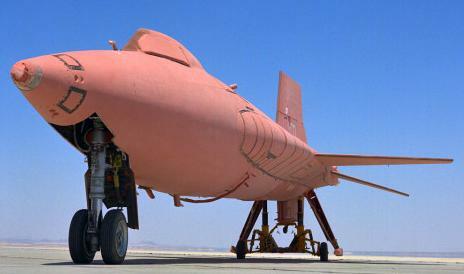 2 x X-15A-2 Tanks. Gross Mass: 7,026 kg (15,489 lb). Empty Mass: 902 kg (1,988 lb). Isp: 276 sec. Burn time: 55 sec. Isp(sl): 239 sec. Diameter: 0.98 m (3.21 ft). Span: 0.98 m (3.21 ft). Length: 6.86 m (22.50 ft). Propellants: Lox/Ammonia. No Engines: 0. Engine: None. Status: Out of production. Stage 2. 1 x X-15A-2. Gross Mass: 16,069 kg (35,426 lb). Empty Mass: 7,766 kg (17,121 lb). Thrust (vac): 262.445 kN (59,000 lbf). Isp: 276 sec. Burn time: 90 sec. Isp(sl): 239 sec. Diameter: 1.42 m (4.65 ft). Span: 6.80 m (22.30 ft). Length: 15.47 m (50.75 ft). Propellants: Lox/Ammonia. No Engines: 1. Engine: XLR-99. Status: Out of Production. Family: aircraft-launched, Rocketplane, Spaceplane, Suborbital, US Rocketplanes. Country: USA. Engines: J57-19, None, XLR99. Propellants: Lox/Ammonia. Stages: X-15A-2 Tanks, NB-52, X-15A-2 stage. Agency: USAF, North American. Bibliography: 38, 4312, 44, 459, 49, 97, 7027.